With Chronicle, anyone can write short stories for here and now. Here at Chronicle, we love our authors. We can't wait to read your story and we want to help you get discovered. We made Chronicle so you can be heard. Chronicle curates just a handful of stories at a time. You'll never get lost in the noise if we publish your story. 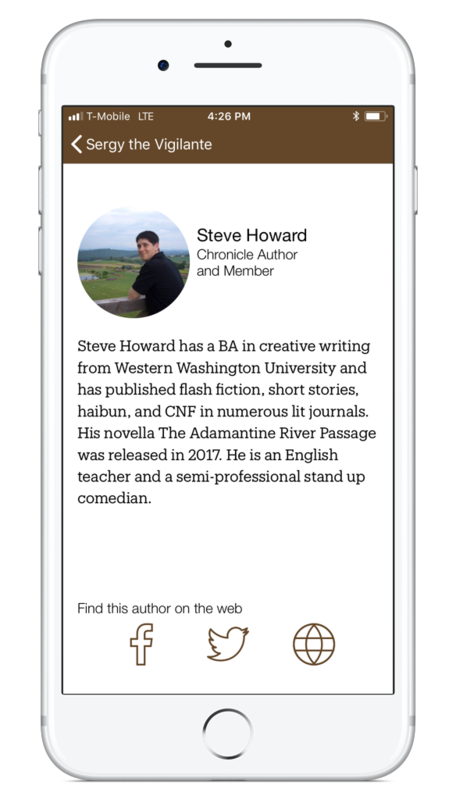 Every author gets a profile with a photo and brief bio, plus links to your social media and website. Each story that we publish on Chronicle gets featured with an editorial feature that encourages our readers to look closely at your writing. With your help, we can secure a future where everyone's a reader. Contributing to Chronicle is easy, and you don’t have to be a professional author. If your story is under 1000 words, we want to read it. You can reach a whole world of readers with Chronicle. By writing for Chronicle, you agree to our Terms of Service. Your email will be kept private. We will use it to contact you about featuring your story in Chronicle. I agree with Chronicle's Terms and Conditions. The above fields are required.